If the government feels committed to fulfilling the ideals of Imam Khomeini, President Rouhani should have criticized Hammond who said that Iran has shown a more nuanced approach toward Israel. President Rouhani has always insisted on staying true to the late Imam Khomeini’s line of thinking. But an editorial by Seyyed Masoud Alavi published by principlist daily Resalat on August 26 argued that the remarks of British Foreign Secretary Philip Hammond during his Iran visit cast doubt on such commitment. Iran, a Persian-language daily which is affiliated with the government, published an opinion piece by the British foreign secretary on August 25 titled “Iranian Audacity to Explore New Ways”. In an interview with the BBC before meeting with President Rouhani toward the end of his Tehran visit, Philip Hammond said that Iran has shown a more nuanced approach toward Israel. His comments came despite the fact the whole world knows well that during more than three decades since the Islamic Revolution, Iran’s stance on usurping Israel has remained unchanged. The key question here is what Hammond meant by saying that Iran has shown a more nuanced approach with Israel. Time and again, the late Imam Khomeini said that every Muslim is duty-bound to equip himself against Israel. The late Imam also said “I have repeated warned about the threat posed to the nation by the Israeli government and its agents.” He also said that Israel must be wiped off the face of the earth. Given the clear stance of the late Imam on the Zionist regime of Israel, is it right for Hammond to talk of a shift in the stand of the Iranian government toward Israel in Tehran?! 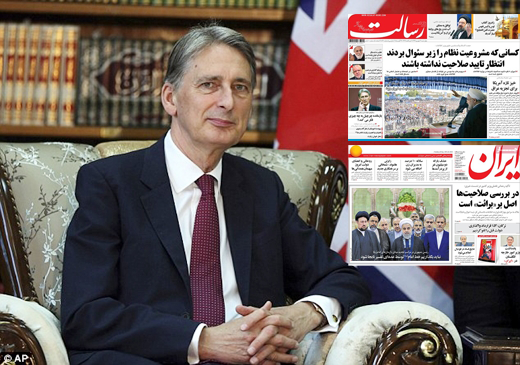 If the government, as the president says, feels committed to fulfilling the ideals of Imam Khomeini, the editorial of the government-run daily should have criticized Hammond for his remarks and laid out the stance of the establishment on Israel rather than let the British foreign secretary write a piece in the state-run newspaper and talk about “testing the new waters” in Iran. In a speech at the mausoleum of Imam Khomeini, the president said “We should not let the late Imam’s line of thinking and ideals be misinterpreted by some”. That remark is very true. But, shouldn’t president have fleshed out a foreign policy in line with the late Imam’s principles and talked about the unwavering stance of the late Imam on the US and Israel? 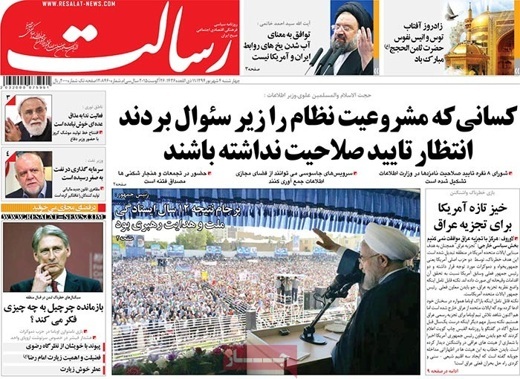 Shouldn’t he have – in his speech at the late Imam’s mausoleum – touched on the ominous anti-Iran plots of hegemonic and arrogant powers who seek to extend their influence in the country and across the region? Shouldn’t he have elaborated on his government’s measures to prevent the infiltration of the intelligence services of the enemies and the danger of seditionist return to the political scene? At Imam’s mausoleum, the president should have said that the US is still the enemy of the Iranian nation, and a classic example of an arrogant power. He should have said that on behalf of the Iranian nation, his government would not let the American dream of regime change in Iran come true. In support of the late Imam’s beliefs, the president should have said loud and clear in his speech that his administration would stand up to the US bullying even if it involved use of force and that Iran seeks to wipe out the corrupt roots of Zionism around the world. Such a stance would have stopped any possible misinterpretation by the enemies of the establishment and would have presented a correct interpretation of Imam Khomeini’s brave stance in the face of the sworn enemies of the establishment. On top of that, it could have reaffirmed the fact that the foreign policy of the 11th government is in line with the Imam Khomeini’s positions.